Segwit, the long awaited pack of optimizations to scale Bitcoin has been activated on August 24th. 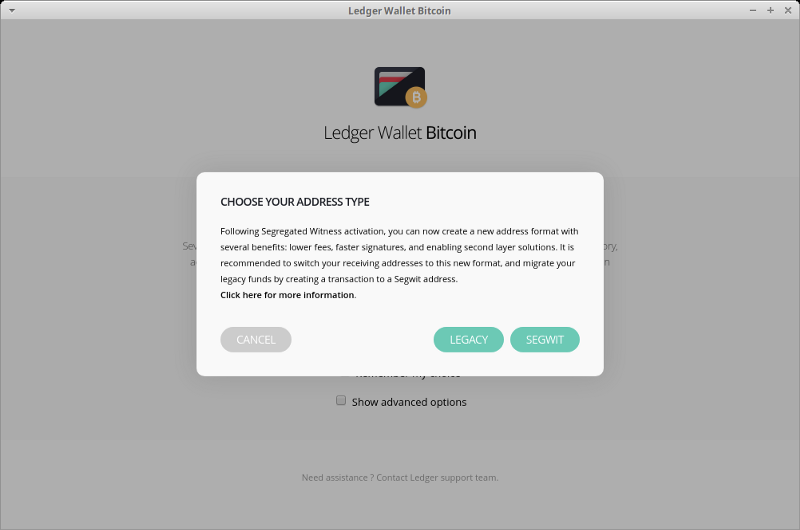 This article explains how can you use Segwit benefits with Ledger’s hardware wallet products. You can access your new Segwit addresses or legacy addresses (where you will find your current funds) when starting the Bitcoin Wallet Chrome application (from v1.9.0). As Segwit migration is fully opt-in, you can continue to use only legacy addresses. If you wish to upgrade, you can recreate the same account naming and structure on the Segwit branch, and move your funds from the legacy branch using Bitcoin transactions. As upgrading to Segwit addresses helps providing more block capacity for every user, it’s definitely recommended to upgrade. Note that the sender doesn’t need to upgrade — every wallet can natively send funds to a Segwit address. If you do not wish to use Segwit, or if you are not sure about anything, just click on the LEGACY button and you’ll access and manage your accounts as it was before. When computing a Segwit signature, the previous transactions do not need to be processed by the device, and each input is only processed once during the signature process, leading up to a 60% time optimization in the signature process. For more information, you can refer to our original article on the subject and this Bitcoin Magazine article. For more information, you can refer to this article on the subject. Segwit paves the way to multiple Bitcoin scripting optimization (through anti malleability and script versioning) — we’re closely monitoring progress on those different topics to let you use your Ledger Hardware Wallet with those innovations (such as the Lightning Network) as soon as possible. Segwit support for Ledger products is available in GreenAddress (desktop, Android) and GreenBits (Android). Segwit support is also available for Litecoin. Word of caution to Bitcoin Cash users : NEVER send Bitcoin Cash to a Segwit address generated on the Bitcoin network — you wouldn’t be able to recover your coins.